With fewer than 500 members, the Maijuna people remain one of Peru’s most vulnerable indigenous ethnicities. In an effort to help protect the ancestral homeland of the Maijuna people, the 977,000 acre Maijuna-Kichwa Regional Conservation Area in the northern Amazon of Peru was created in 2015. This reserve protects a vast area of Amazon rainforest that preserves a vital piece of the Maijuna’s cultural identity. Nature & Culture has once again partnered with the Maijuna people and the Regional Environmental Authority of the area to create the Maijuna-CIM Interpretation Center. Located in the native community of Sucusari, off the Napo River in the Peruvian Amazon the Maijuna-CIM Interpretation Center is run by the Maijuna Cultural Association. The Center is promoted by Explorama Tours, a tour company located in Loreto who brings people to Sucusari to experience the Maijuna culture. 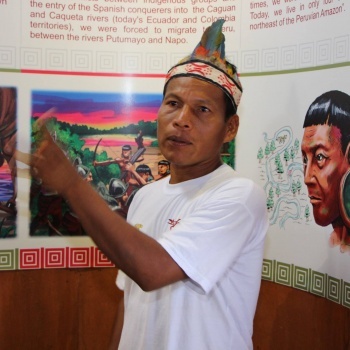 Tourists are able to learn the history, ancestral traditions, and worldview of the Maijuna people. The income from the tours as well as handicrafts that are sold as souvenirs is an additional income source for the community. The Maijuna Interpretation Center utilizes education and ecotourism to create a productive conservation model that enhances the communities economic opportunities and quality of life.